Starting your own Cooking Group is Boss! There is some prep work involved, but it really pays off when it is done, and you will be glad you put the work into it. Cube meat, and season very well. Pat dry with paper towels. Sear the meat in a hot pan with oil, leaving room between the pieces. It will take about 5 batches, depending on the size of your pan (I browned mine on the stovetop in the dutch oven). When all the meat is well-browned, remove and use the wine to deglaze the pan. Scrape up all the brown bits, and let boil for a minute or two. Put the meat back into the Dutch oven with the wine, and add the beef broth. Take the water, flour, and tomato paste and whisk together very well until there are no chunks of flour left, then add to the pot. Add the next 5 ingredients, and cook on high for 1 hour (or in a 350 degree oven). It may seem like this mix is a little salty, but once all the other ing are added, it will even out. After the hour, turn the heat to low (or 230 degrees) and add the potatoes and carrots, and continue cooking for another 7 hours. It is important to go the full 8 hours to get the meat to break down and the sauce to thicken. It will look very watery until then, so don’t freak out! At the 7 hour mark, open the lid and WITHOUT STIRRING remove the fat on the top of the sauce. You can use a big spoon to get most of it, and then lay paper towels gently on top to soak up the rest. The paper towel trick is fantastic, and I have used it many times to get the fine layer of fat off of sauces and soups without using a spoon for an insane amount of time. When it’s done, you can decide if you want the stew gravy to be thicker. Just add a little more flour and water (whisked together) and it will thicken more. In a saute pan, brown the pearl onions in some butter to give them great flavor and color, then add to the stew. Finally, the thawed peas and chopped parsley are added last to retain their color and to keep the peas from mushing out. Enjoy all of the appreciation and admiration you will get from those you serve this to, you deserve it! All you need now is good crusty bread and some wine to complete the meal. Bon Appetit! We don’t use too much beef either. 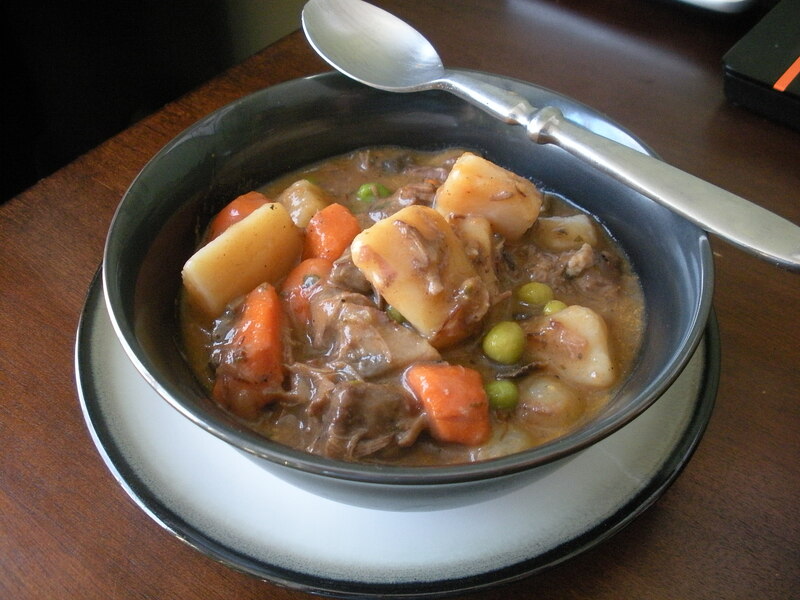 However, nothing beats slow cooked beef stews and broths etc… They are simply delicious. I posted beef in guinness casserole recently. You should check it out, you might like it 😀 Thanks for sharing this recipe. I remember this stew. And, yes, it was very good!!! Subscribe to Aubergine & Butterbean! Homemade Chai Concentrate – the gift that reminds people why Starbucks is unneccesary.